San Antonio de Areco, which lies approximately 70 miles north west of Buenos Aires in the heart of the Pampas, was founded in 1730 around the pretty church of San Antonio de Padua. It is a popular getaway from the capital either for a quick day trip or weekend escape. But the town is best known for its gaucho and criollo traditions and horses are very much part of life here. If you've come to embrace the cowboy lifestyle the best places to stay in San Antonio de Areco may well be on a ranch outside town but for experiencing this City of National Historic Interest you'll want a more central spot. San Antonio sits on the Areco river and is probably most notable as the homeland of the fictional hero Don Legundo Sombra who is the central character of the eponymous novel by Ricardo Guiraldes, one of Argentina’s great wrtiters and poets. The book is a celebration of the Gaucho lifestyle and this theme very much encapsulates the feel of the city. There is even a Museo Gauchesco Ricardo Guiraldes! The city is quite compact and thus easy to get around either on foot or by bicycle and there are plenty of colonial architectural gems to be admired. For the more energetic this is a great place for horse riding, walking, cycling, rowing or carriage touring. The gaucho and criollo horse traditions, something unique to the area and not be missed! Explore one of the many ranches on the outskirts of San Antonio de Areco. For more active adventurers there is plenty of horse riding, walking, cycling, rowing or carriage touring. In November there is the Dia de la Tradicion - a celebration of all things ‘Gaucho’ and the highlight of the year in San Antonio de Areco. If you plan to visit for this, the best places to stay in San Antonio de Areco will be very busy, so get organised and book well ahead. 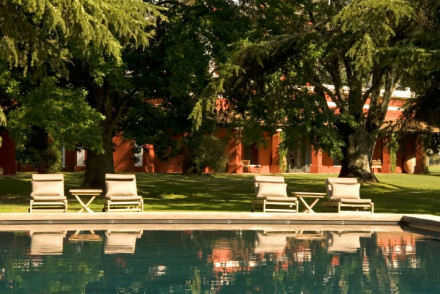 La Bamba de Areco is a very smart ranch property situated in a wonderfully secluded position. The rooms are colonial in style - all teak furniture and parquet flooring with french doors leading onto quiet terraces. The regional cuisine is served al fresco. Horse riding is very much de rigeur! The best time to visit the area is from November to March, where the average temperature ranges from 24-28 degrees celsius. This hot season coincides with the wet season in the area, so remember to pack some waterproofs! A chic ranch property situated in a wonderfully secluded location. Colonial styled rooms have a grown-up feel with heavy teak furniture, dark parquet flooring and french doors opening onto quiet terraces. Regional cuisine is served in the outdoor dining area. A completely tranquil spot. Active Holiday - Resident horses at your beck-and-call and miles of countryside to explore. Riding - With beautiful horses kept at the hotel this is a horse-lovers dream. Sights nearby - Take a walk through the picturesque 18th century town of San Antonio de Areco. Restrictions on children - Over 12s are welcomed.